If you are looking for a delicious and festive Christmas cookie, these Chocolate Crinkle Cookies should definitely be top of your list this holiday season. Not only do they taste delicious but they look so Christmassy, too! Looking for a gift for your neighbors? 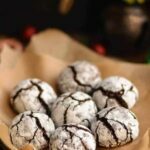 Pop these Chocolate Crinkle Cookies in some cellophane and wrap with a ribbon and a cute gift tag for a wonderful gift. Of course they make great teacher and colleague gifts and they’ll be a hit at any cookie swap! I do hope you’ll make them and enjoy eating them as much as I did!! Preheat oven to 350 F once you are ready to bake. Line a couple of cookie sheets with parchment paper and set aside. In a bowl, whisk together cocoa powder, sugar, baking powder, salt, instant coffee granules and ground cinnamon. Make a well in the middle and pour in the oil. Whisk in the egg and the vanilla extract. Add the flour bit by bit and using an electric mixer beat everything together till mixed. The dough will look sticky. Refrigerate for 30 to 45 minutes till the dough is firm enough to be rolled into balls. Using a small ice cream scoop, scoop out little balls of dough. Roll the little balls in powdered sugar and cinnamon powder mix. Arrange on the prepped cookie sheets. Transfer to a cooling rack once the cookies are cool enough to be handled and let the cookies cool down completely before serving. It looks like a truffle but it’s biscuits, great for kids to bring to school for a little snack, I think it’s easy to do, I’ll try it here. Just delicious, a great cookie! Thanks so much for sharing your awesome recipe with us at Full Plate Thursday! Hope you are having a wonderful week and hope to see you soon! Oh well, I am bookmarking these for next year. how many pieces did you make with this recipe? Just made a batch of these to give to the neighbors. I really like the addition of the coffee granules to bump up the chocolate flavor. Next time I’m using your recipe. Thanks for sharing it at the Over the Moon link party. Don’t forget to come back Jan 8 an party with us in the new year. Looks like a perfect version of a Christmas classic. Thank you for sharing! I make these every year for Christmas and i always eat too many. They remind me of mini-brownies!